The striping, bike stencils and hash lines are done on Spruce St from Broad to 21st. 11th St to Broad striping is in but no stencils or hash lines. E of 11th line painting going on Pine St today. 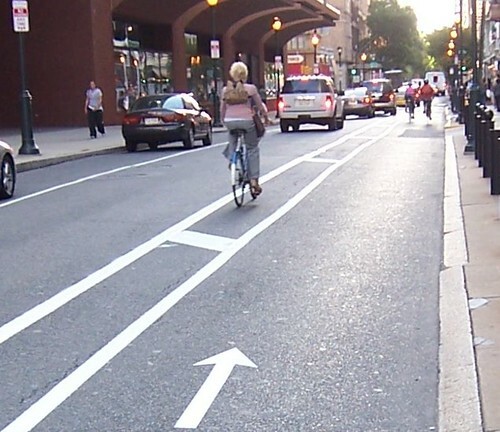 The bike lanes appear to have quickly attracted cyclists even before they are done. As we have noticed on the Walnut St Bridge and on 22nd St, bicyclists often travel in platoons of 3 to 4. Some drivers are confused at this point partially due to habit and the lack of "bike only" signs. A few are defiant and drive in the bike lane especially west of Broad. But the bike traffic in the bike lane is slowing those who want to drive through. It's unfortunate but i don't think that this pilot program will make it to the next level. Some drivers are outright beligerent about losing one of their precious lanes. I personally don't have much reason to travel Spruce or Pine but now I will be certain to do just that to show more cycling presence. Others should do the same. But please, fellow cyclists, obey the rules of the road. Motorists don't need another reason to shoot this project down.